Summary: (from the back of the book): It is 1936 in Flint, Michigan. 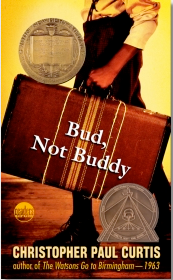 Times may be hard and 10 year old Bud may be a motherless boy on the run, but Bud's got a few things going for him. One, he has his own suitcase full of special things. Two, he is the author of Bud Caldwell's Rules and Things for Having a Funner Life and Making a Better Lier Out Of Yourself. Three, his mama never told him who his father was but she left a clue: fliers advertising Herman E. Calloway and the Dusky Devastators of the Depression!!!!!! Bud's got an idea that those fliers will lead him to his father. Once he decides to hit the road and find his mystery man nothing can stop him. Not hunger, not fear, not vampires, not even Herman E. Calloway himself. Review: This is the best book I've ever read! One part of this book was very exciting because the author waits until the end of the book to tell the reader if Herman E. Calloway is Bud;s dad. That was a very smart thing to do because it made me want to keep reading and find out the truth. Another exciting part was when I figured out who Herman E. Calloway was. Finally, I thought it was really fun when Bud became friends with the band members because he felt like they were his family. One person that stood out to him was Steady Eddie, the saxophone player, who was really respectful and gave a lot of advice to Bud. Wow, I'm surprised (and glad) to hear you say it's the best book you've ever read. I began reading it to my class a few years ago, as it won the Newbery I believe?, but they didn't like it, so I didn't pursue until the end. Now I feel that I should pick it up again. We have wiser eyes than children, often times.